Flag Design: A skull over waves, with crimson bones to represent a crimson sky. 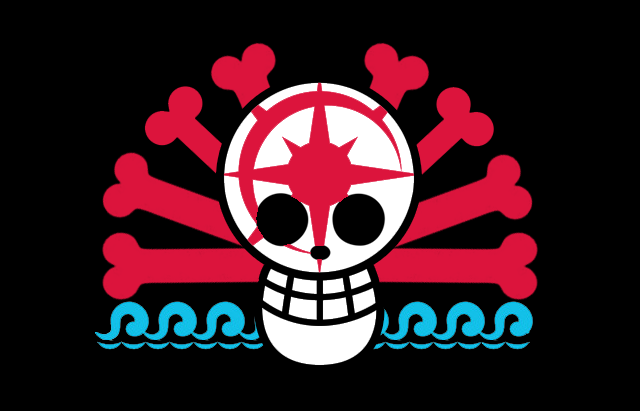 The skull has a red star-like symbol on it. Put all your crew members here. Remember to include the captain as well. Just going to leave this here in case somebody reading this page is thinking about joining us. The idea behind this crew is a small group of powerful individuals who share close bonds and put each other (and themselves) before everyone else. Everyone in the crew is expected to have a goal of some sort, although they don't need to have the same goal as everybody else in the group. This is not a group of "good" pirates like Luffy's crew, nor is it a group of "bad" pirates like Doflamingo's. This group is meant to be neutral - placing themselves AND each other above all else. Yet when they have to, it's expected that your character is willing to go to certain ends and extremes that the "good guys" would balk at. Whether that's sacrificing a stranger to save yourself, stealing from the poor, or just cold-blooded murder. At the same time, there needs to be a purpose behind the actions, and your character needs a certain code or ethics (even if they don't always abide by it). If your character isn't a PERFECT fit, then don't worry about that - conflicts can be good, and make things interesting. We don't want a group of completely 100% like-minded individuals, after all. But as long as you think your character could fit in here, then that's okay. Don't care about being perceived as "good" or "evil"
If you're interested in joining, PM me on the site or message me on discord.